To Sum It Up: On her seventeenth birthday, Violet Eden is about to get the surprise of her life. She is destined to become one of the Grigori, part-angel/part-human guardians who keep the exiled angels on earth in check. Violet, however, is not sure that she wants to accept her fate, even as the exiles’ determination to eliminate the Grigori intensifies. Review: Embrace got off to a promising start; I really liked the premise and this version of angel lore. As the novel went on, though, I found myself less and less enthused with the main character, Violet. Some of her actions really frustrated me, making it difficult for me to connect with her and with the book. I liked that Violet’s personal philosophy was to never back down from a tough situation, but I didn’t think that she always adhered to it. In fact, I thought that she was rather whiny and petulant at times. She’s very reluctant to give up her life for the Grigori, and I understand her concerns. To a point. Violet spends a good chunk of the book going on about how she’s been lied to, how’s she’s not really being given the choice to decide, etc. I could only take so much of her ranting before it became tiresome. What bothered me the most about Violet was the way that she treated her destined Grigori partner, Lincoln. Again, I understood that she was upset with him for not telling her who she really was in all the time that they knew each other, as he secretly trained her to potentially become a Grigori. Lincoln wasn’t allowed to tell her, and I felt that Violet could have cut him a little slack. She doesn’t, and her anger towards him just continues to snowball. Lincoln essentially turns into Violet’s doormat. There are some extenuating circumstances behind Violet’s behavior, but I didn’t feel that they let her off the hook completely. And then we have Phoenix. This sketchy exile reminded me of Patch Cipriano from Hush, Hush, with his frequent smirks, impertinent remarks, and penchant for turning up wherever Violet happens to be. Yet Violet seems to find him irresistible. I don’t quite get what she sees in Phoenix. I don’t get what she sees in this love triangle’s other vertex, Lincoln, either. Neither of these guys was interesting enough to set my heart aflutter. 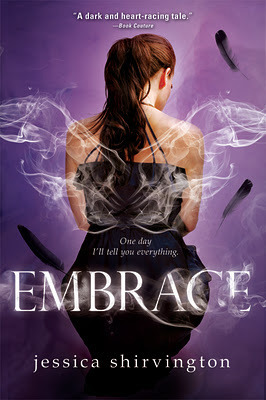 In the end, Embrace just wasn’t my kind of book. I’m all for tough, independent heroines, but I couldn’t warm up to Violet. I think that she still has some growing up to do, though it’s unlikely I’ll be reading the sequels to find out if that happens. All in All: Fans of Hush, Hush might enjoy Embrace. I wasn’t too crazy over the former, so if you’re like me, then you might want to try borrowing Embrace from the library first before investing in a copy.